The transmission was cut instantaneously. That night, everything Krasovsky had done for the channel was purged from its site. Later that night, he was fired—via text message. In Moscow, one of my closest friends is Mike, a gay American journalist. In 2010, he met Fedya, a Russian seven years his junior. Mike called the next day to tell me he had met “the one,” and soon they were living together—nesting really. They made a conscious decision not to hide their sexuality. They held hands in the streets, they kissed in public, and, amazingly, no one seemed to mind. One day, Mike and Fedya went to a party for Fedya’s older brother, a soccer fanatic. “We pull up to the house, and there is heavy-metal music playing, a bunch of dudes swilling cognac and vodka out of plastic cups. And we walk in and all heads snap in our direction,” Mike recounts. One of the friends, who had clearly spent most of the afternoon drinking, was watching with a wary, slanting look. Later that evening, he approached Mike: “I was sure he was going to try to pick a fight. Instead, he thrust a cup of cognac in my hand, raised his glass, and said, ‘It doesn’t matter what kind of love it is, as long as it’s true love.'" This story of the party comes from an essay Mike wrote about Fedya’s family learning, grudgingly, to accept their son. It was never published, because Fedya’s mom worried about her friends’ reaction. Mike is Mike’s real name, but Fedya is not Fedya’s name. Maria Kozlovskaya is a lawyer and she was asked to resign from her previous job at the Russian branch of a Western tobacco distributor. “My boss said we don’t align on certain core principles,” Kozlovskaya says. “She thought that gays are all pedophiles who corrupt children.” Kozlovskaya came out to her mom about seven times, and, each time, her mom pretended it was news. There is a group in Russia called Occupy Pedophilia run by a neo-Nazi named Maksim “the Hatchet” Martsinkevich. The group uses young men to lure older men into sexual encounters, at which point Maksim, usually shirtless, interrogates them on camera before pouring a bottle of urine on their heads. One young man in the city of Pskov was targeted by the Hatchet and complained to officials. In return, the Hatchet and his goons posted a 15,000 ruble ($450) bounty on his head. Terrified, the young man came out to his mother and asked for her help. His mother said she didn’t care about his sexual orientation and dragged him off to file a police report. The same thing happened to a young man in Perm, in the Ural Mountains. He told his mother; she promptly disowned him. A February issue of Afisha magazine featured the stories of 30 gay Muscovites. 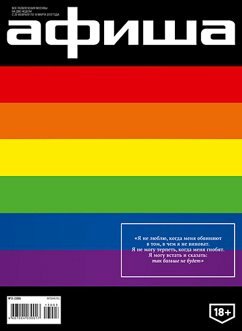 In February, as the gay-propaganda law made its way through the Duma, a popular Moscow magazine called Afisha ran a rainbow flag on its cover. Inside were the stories and portraits of 30 gay men and women of Moscow. They were lawyers, entrepreneurs, nurses, and I.T. specialists; there was even a welder named “Sergei Ivanov,” the Russian equivalent of John Smith. They told the stories of their “kaming aut”, which has become Moscow slang for any moment of honesty. One subject was Alexander Smirnov, a press attaché in the Moscow mayor’s office. “I hide the fact that I’m gay,” he told Afisha. “If someone at work starts joking about fags, I smile like an idiot.” He broke his silence after hearing Putin and Medvedev boasting that there was no anti-gay discrimination in Russia. Smirnov predicted to Afisha that, after the article appeared, “they’ll quietly ask me to turn in my resignation.” A few days after publication, that’s exactly what happened. Sasha, an acquaintance of mine, was 40, single, and childless. Shortly before I left Moscow last fall, she had approached our mutual friend Boris, a raucous young gay man who co-owns several of the restaurants and bars we loved to linger in. She and Boris both belonged to the cozy cocoon of the city’s old intelligentsia, so she asked Boris if he’d father a child with her, and he agreed. This was not kept secret, nor did people seem to judge their unorthodox non-coupling. On June 18, their daughter, Elena, was born. “I am incredibly, incredibly grateful to and happy for our daddy Boris,” Sasha wrote on Facebook. The accompanying picture gathered more than 1,000 likes and hundreds of ebullient notes. I’d never seen this circle await a child so eagerly. And yet, although Elena was born the day the Duma passed a law banning foreign adoptions by gay couples, and a week before Putin signed the gay-propaganda bill into law, no one drew a connection between her birth and a legislative push that prohibits anyone calling Sasha and Boris’s relationship “normal.” People welcomed Elena because everyone adored Sasha, and everyone adored Boris, and everyone in Moscow loves babies.